Intensely negative self –concept, low self-esteem. Difficulty in thinking, concentration and decision making. 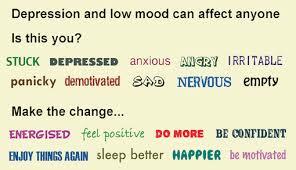 The onset of disorder:- The average age for depression is 30 years. Studies showed that incidence of depression and consequent suicide is steadily increasing over the years. The national morbidity study has shown that increasing younger groups called as cohorts have higher prevalence rates than older people. Individuals aged 18-29 years are more likely to become depressed at the earlier ages than the people in the age group 30-44 years. In short, depression has started surfacing at an early age with greater frequency. Stress and depression significantly affects a person’s family, occupational and personal relationships, Work or school life, sleeping and eating habits, daily routine and general health. Its impact on functioning and well-being has been equated to that of chronic medical conditions such as diabetes. A person having a major depression usually exhibits a very low mood, which interferes in all aspects of life, and an inability to experience pleasure in activities that were formerly enjoyed. They develop feelings of worthlessness, inappropriate guilt or regret, helplessness, hopelessness, and self-hatred. A depressed person may also report multiple physical symptoms such as fatigue, headaches, or digestive problems. As far as cause of depression is concerned biological, psychological, and social factors all play a role in causing depression. Twin studies shows that there is a genetic contribution to depression. The studies of three generation of children, parents and grandparents, show that this disorder tends to run in families. If major depression is present in parents and grandparents, children are more likely to show symptoms of depression. Various aspects of our personality and temperament appear to be integral to the occurrence and maintenance of depression. Low self-esteem, lack of self confidence and self-defeating or distorted thinking of a person can lead to depression. The experiences of early loss, separation and rejection by the parent or caregiver may all lead stress and depression in a person. Early maternal loss, lack of a confiding relationship, responsibility for the care of several young children at home, and unemployment—can interact with life stressors to increase the risk of depression and chronic stress. Health and economic problems, changes in relationships with a spouse or adult children due to the transition to a care-giving or care-needing role, the death of a significant other, or a change in the availability or quality of social relationships with older friends also result in stress and depression. Poverty and social isolation associated with increased risk of mental health problems in general. Child abuse (physical, emotional, sexual, or neglect) is also Associated with increased risk of developing depressive disorders later in life. Disturbances in family functioning, such as parental (particularly maternal) depression, severe marital conflict or divorce, death of a parent, or other disturbances in parenting are additional risk factors. Many sufferers not to even discuss their symptoms and problems with doctors, family members, relatives or friends. In the next article we will discuss about the treatment of depression in detail. If you find this article is useful, kindly comment and share it. I dnt no ki mai q hamesa darti rahti hu or khud hi khud se bate karti rahti hu..mai pahle ek ladke se love karti thi..bhut mai usko bhul hi nhi paa rhi jabki wah apne life mai bhut khus hai plzz help me mai khus rahti hu andar se dar lagta ki mai sayd bimar hu ajeeb sa fillng hoti hai khoyi khoyi 1yrs ho gye mere brupk ho chuka .fir v mai kisi or k bare mai nhi sochti hamesa hamesa bas usi ko yadd karti rahti mai khud chahti usko bhulne ko pr nhi kar pati plzz koi ek upay batayh warna sayd mai khud ki jaan le lu…mera chota sa priwar he mamy papa ek vaiya or mai..jab bahar rahti to khus rahti or kuch time k liye wah yadd nhi ata at jaise gar ayi mera sir dard hone lagta mere madicn v leti aram to ho jata par fir dard suru rat ko kafi let soti hu 2/3bje i dnt way..bt Plzx mera apse rqst he mujhe is problm se bahar nikane mai help kre..